One of the frustrating things about owning a computer is that, sooner or later, it can’t keep up with the demands of your software. But there’s some good news: you can help your computer keep up with the times by upgrading its Random Access Memory (RAM). RAM helps your computer run applications. Your computer stores temporary information within the memory cells and refers to the data as it runs applications. When a computer runs short of RAM, it’s forced to swap the overflow data on and off of the hard drive, which can significantly slow performance. Chances are your computer has plenty of capacity for more RAM. It will likely speed things up, and it’s easier to install than an SSD, which requires you to move your operating system and other files. While installing additional or all-new memory is not terribly complicated, even for a beginner geek, buying the proper memory can be a frustrating challenge. Will extra RAM make my PC faster? 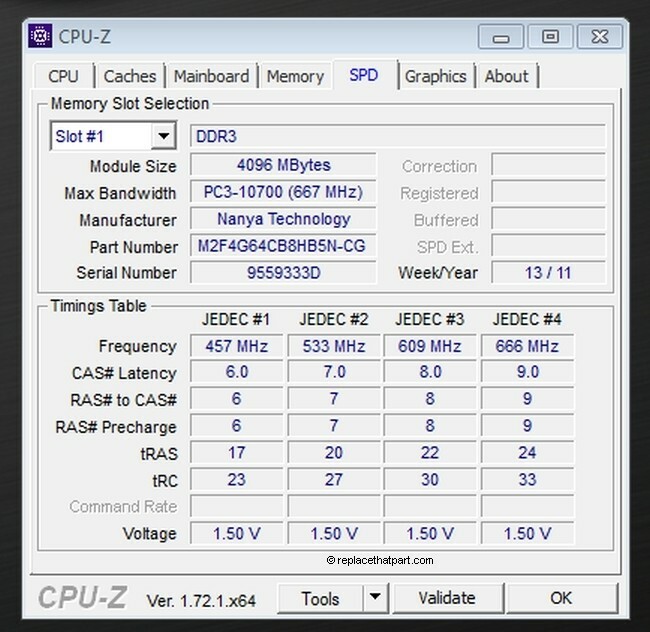 Does RAM affect how fast the PC starts up? The capacity and speed of your computer’s system memory, or RAM, can have a noticeable effect on your computer start-up speed. Faster RAM can improve communication speed with the processor and decrease load times. Also, having enough RAM capacity to load the entire operating system and all start-up programs will improve load times. However, as long as you have enough RAM, it is not what’s going to have the biggest impact in computer start-up time. The processor and motherboard can handle the data load without a problem, but the hard drive slows down the show. The hard drive is not as fast as the RAM or the CPU. 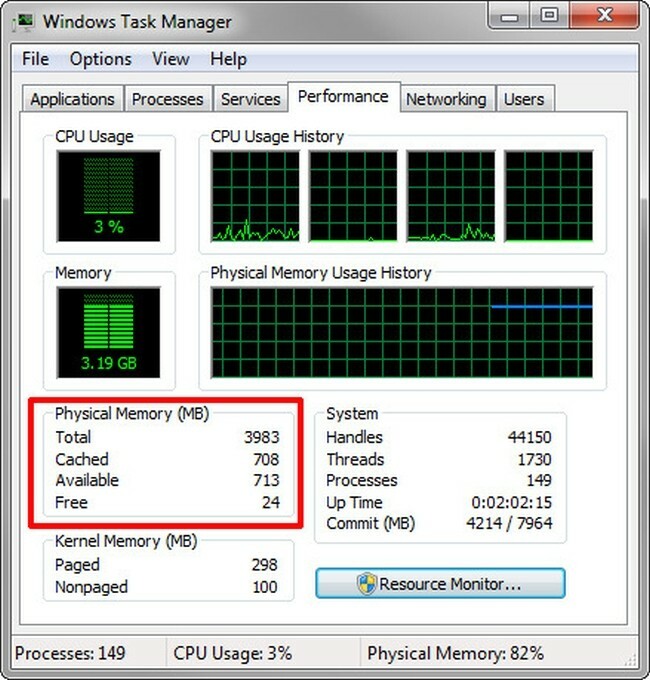 To find out if your pc might need more RAM, right-click the Task Bar and select Task Manager. Click the Performance Tab: In the lower-left corner, you’ll see how much RAM is in use. If, under normal use, the Available option is less than 25 percent of the total, an upgrade may do you some good. If you’ve already figured out the memory you have installed, you can use the drop-down menus on the left to select your system. They will give you some great information about what your computer can support, along with a list of questions and answers. 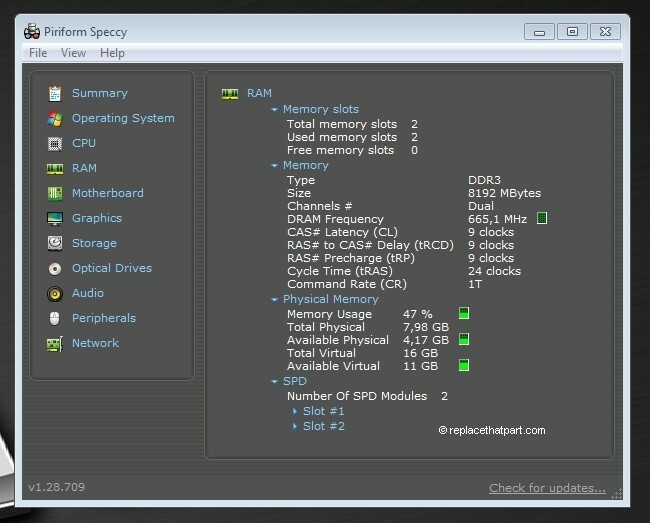 The first option is to open your computer case up and remove the existing RAM so that you can inspect it and see how many empty memory slots you have in your system. While this sounds like the harder option, it’s the best way to learn about the hardware in your computer. By taking the time to do it yourself, you could save a lot of money in the future and save you from an expensive service call in the future. 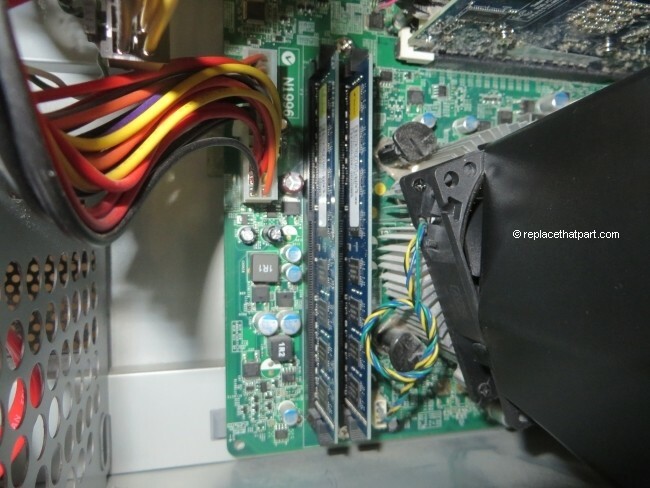 Ground yourself before handling the RAM to avoid electrostatic discharge. 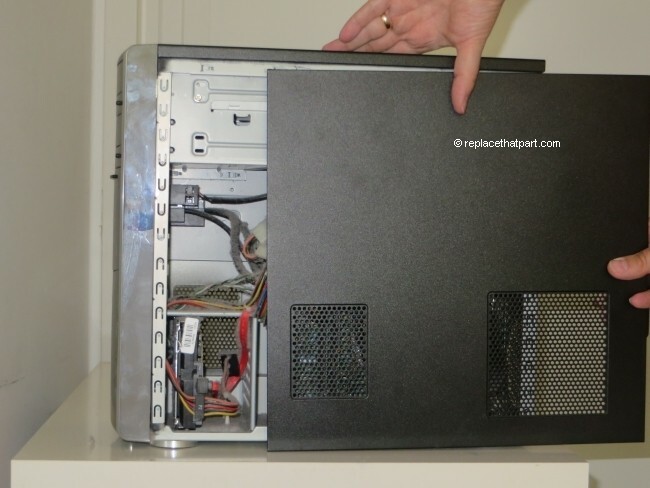 Touch some grounded metal (like a tap, or the unpainted metal surfaces on your computer’s frame) first. 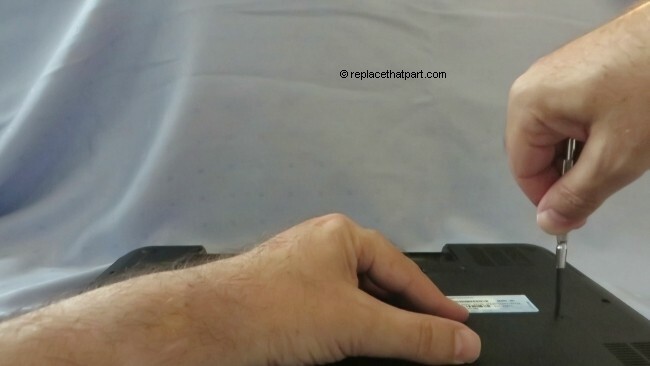 Opening the case of your computer is an easy task, usually only requiring you to remove some screws from the back panel. Every motherboard is set up a bit differently, but the DIMM slots will be the smaller slots usually located next to the processor. The slots are usually easy to spot as the memory sticks are grouped closely together. The DIM sticks are usually long and thin, and rectangular in shape. In many cases, when you pop open the case you will discover only one or two of your RAM slots are actually being used. 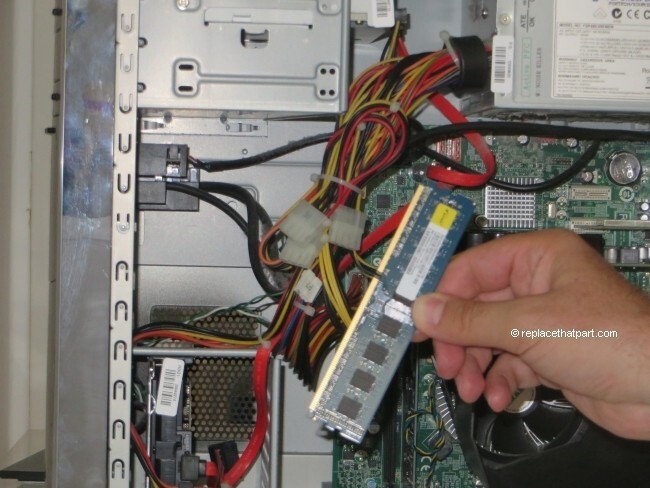 To remove the RAM, simply press down on the tabs located at either end of the slot, then physically pull the memory out. Personally I use chopsticks to push the tabs open. “Officially” you should NOT use any tools to open the tabs. If you damage the slot, it might cause an expensive repair. c. Click the down arrow next to Slot # to view how many memory slots are in your computer. 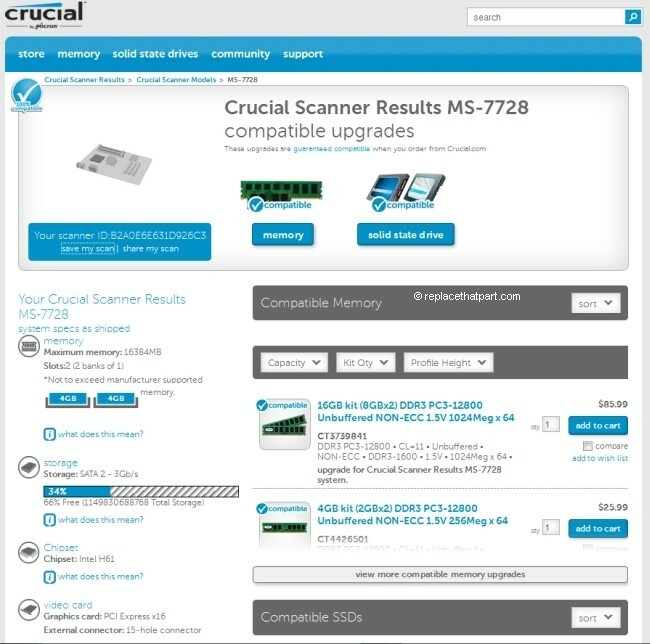 You can usually find the specs for your system online and figure out what memory types your computer takes. 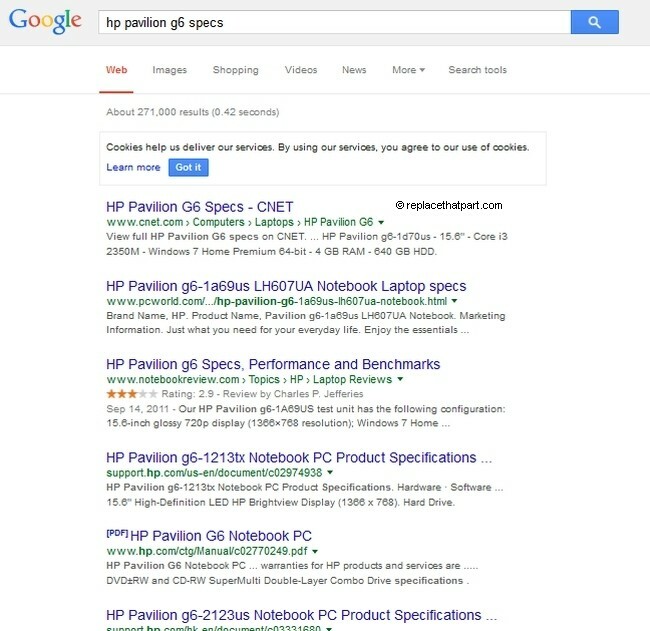 Use Google and search for “[your modelnumber] specs”. Note that this is not the most reliable method of finding information about your pc’s hardware. 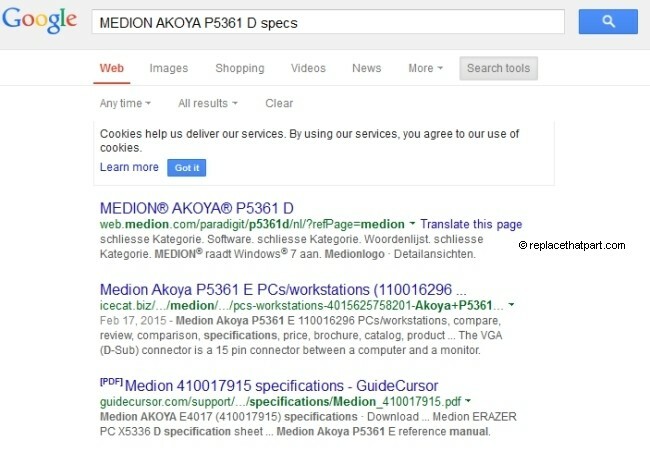 Many manufacturers provide a type of model name on the PC’s case, but this name or number might not be sufficient to obtain support for your computer. 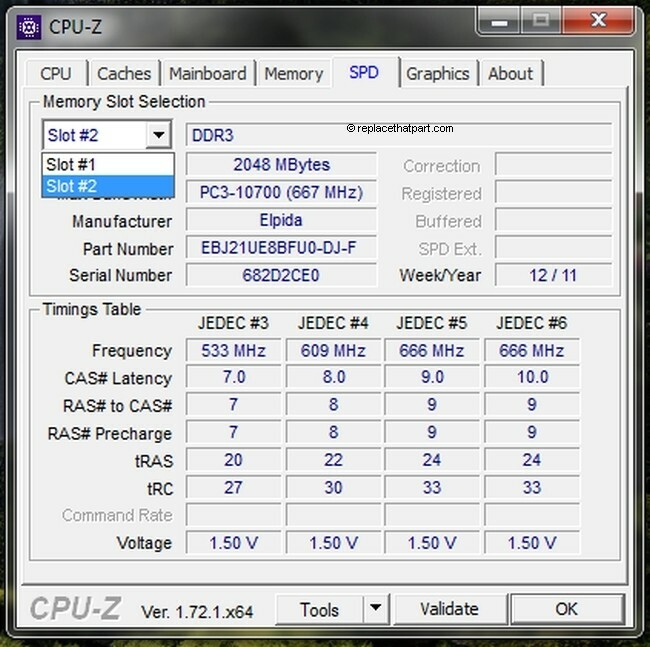 These names or numbers often represent a series of many computers that look similar, but have different options, parts, or configurations. Pull out the manual for your computer or motherboard, and take a look at your receipts to figure out what you bought last time. 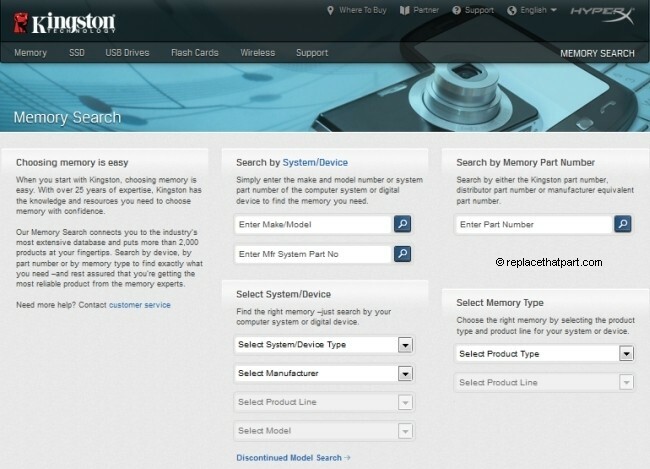 If you built a computer with parts from an online retailer (like Newegg), you can look at your order history to re-order the exact same memory module if you know you have empty slots. At this point you have a couple of decisions to make. How much more memory do you want to add? If you just want to double your memory, and you have a DIMM slot available, then all you need to do is purchase another, identical stick (or module) of RAM. If you want to add more than that, then you have to find a memory module with a higher RAM capacity. 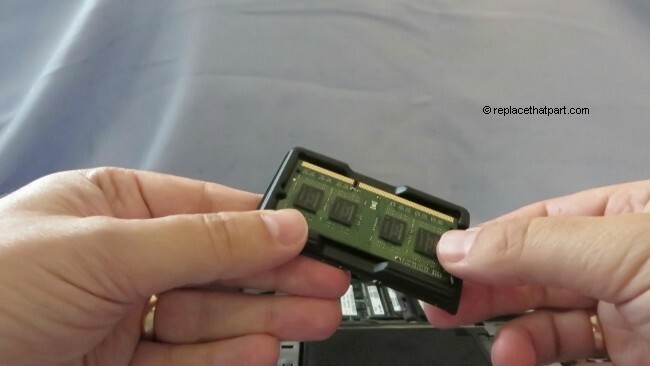 If all of your DIMM slots are filled, then you will have to replace the current memory modules you have with modules with a higher RAM capacity. For instance, if you have only two slots, and both are filled with two 256 MB memory modules, you will have to replace both with, say, two 1 GB modules. 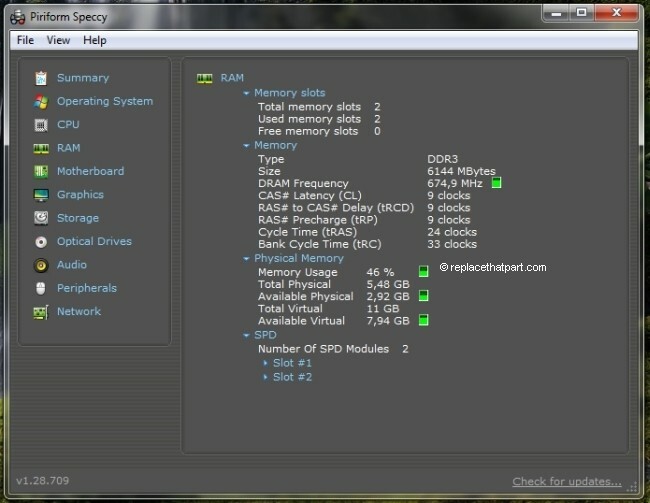 In the case of Microsoft Windows, the basic versions of the operating systems put software limitations on the amount of RAM that can be used by applications, but even in the ultimate and professional version of the operating system, 4 GB is the maximum usable memory the 32-bit version can handle. There’s theoretically no currently reachable upper limit on the amount of RAM addressable in PCs with 64-bit operating systems, though in practical terms 24 GB is going to be the max for most people. Chances are that most PCs manufactured today will be able to handle 8 GB, but it’s best to check to be sure. Speeking of 2015, the baseline for RAM in a computer is 4 GB; that’s how much you can expect from a budget model, and it’ll just about do the job — just don’t expect to be running high-intensity programs or to have several applications open at the same time without performance taking a hit. 8 GB is closer to the current norm, and it’ll be enough to keep your computer fresh for the immediate future. For gamers wanting to keep up with new releases, or if you need access to hardware-intensive programs like video editing software, then it’s worth having 16 GB of RAM at your disposal. Anything beyond that is only really necessary for systems set-up for a particular purpose, or for users wanting to make sure their computer is as future-proof as possible. If in doubt, add more RAM. 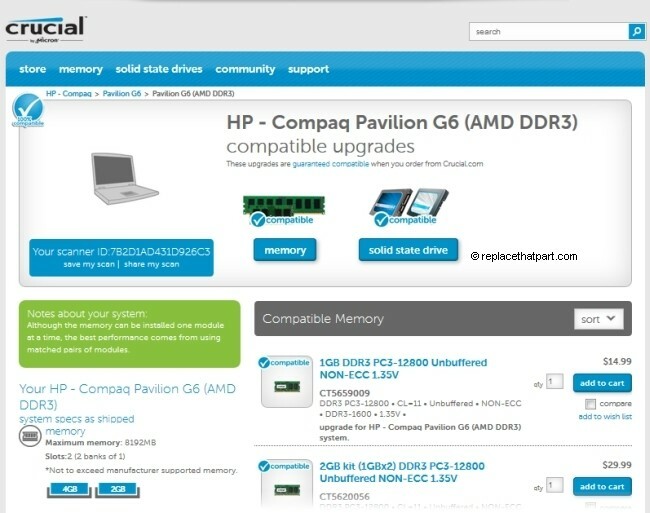 If the RAM you have installed on your computer is less than what you need, don’t fret — these days, a RAM upgrade can be quite inexpensive, and the component itself is relatively easy to install. Keep in mind that because of the way DIMMs are designed, you won’t be able to install one kind of memory stick in a slot meant for a different type. 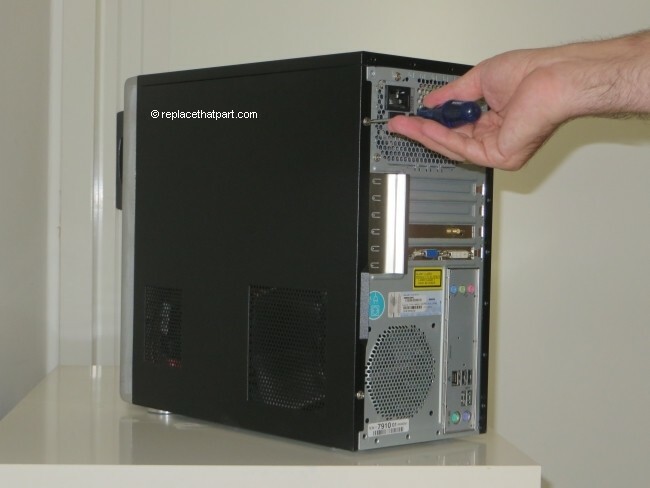 DDR will NOT fit in slots meant for DDR2, DDR3, DDR4 and so on. And SODIMM sticks (Laptop Memory) will NOT fit in slots designed for DIMs. And, in general, DDR2 or DDR3 isn’t going to matter in terms of capacities. DDR4 is faster and more energy efficient, but not inherently capable of greater capacities than DDR3. When installing RAM be sure you place them in pairs which allows them to run at optimal capacity. Installing in pairs means to place the pairs of RAM in slots 1 and 3 or 2 and 4. Registered (also called buffered) memory modules have a register between the DRAM modules and the system’s memory controller. They place less electrical load on the memory controller and allow single systems to remain stable with more memory modules than they would have otherwise. When compared with registered memory, conventional memory is usually referred to as unbuffered memory or unregistered memory. When manufactured as a dual in-line memory module (DIMM), a registered memory module is called an RDIMM, while unregistered memory is called UDIMM. Registered memory is often more expensive because of the lower number of units sold and additional circuitry required, so it is usually found only in applications where the need for scalability and robustness outweighs the need for a low price – for example, registered memory is usually used in servers. Usually the motherboard must match the memory type: registered memory will not work in a motherboard not designed for it, and vice versa. Some PCs will accept registered memory, but registered and unregistered memory cannot be mixed. a. Open the case of your computer. This is an easy task, usually only requiring you to remove some screws from the back panel (though some computers have a latch which is pushed). When in doubt, consult your PC’s user manual. b. Every motherboard is set up a bit differently, but the DIMM slots will be the smaller slots usually located next to the processor. The slots are usually easy to spot as the memory sticks are grouped closely together. The DIM sticks are usually long and thin and rectangular in shape. In many cases, when you pop open the case you will discover only one or two of your RAM slots are actually being used. c. If you’re replacing RAM modules, you’ll need to remove the ones currently in your PC. To remove the RAM, push the two black or white tabs down to release the current memory, then physically pull the memory out. Personally I use chopsticks to push the tabs open. “Officially” you should NOT use any tools to open the tabs. If you damage the slot, it might cause an expensive repair. d. Next, take your new RAM out of its envelope. Be careful not to touch any of the metal connectors or circuitry on the module. Insert your new memory module(s). Align the notch(es) on the module with the notch(es) in the slot, and then press the module down until the clips on the slot snap into place. (It can take 20 to 30 pounds of pressure to install a module.) Fill the memory slots on your computer starting with the highest density (i.e. put the highest density module in bank 0). d. Once the module(s) have been installed, replace the cover on your computer and reconnect the power cord. Installation is now complete. 14. Troubleshooting. 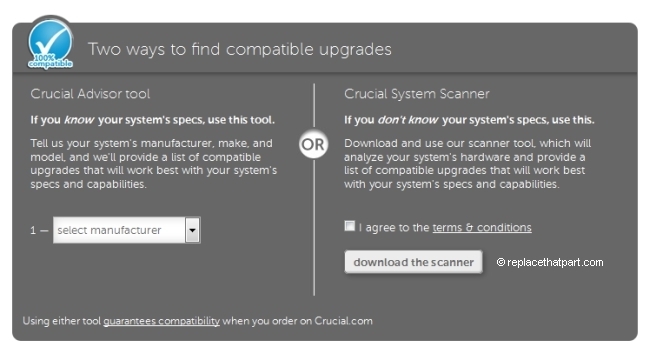 If you have trouble with your new RAM, check these things first. Check the power cords. Is everything plugged in properly? Check the module. Did both side tabs snap to hold the module firmly in place? 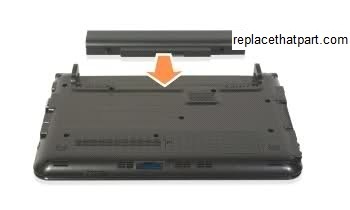 Try removing the module and replacing it to make sure it is seated properly in the slot. If you’re still having difficulties with your RAM, check the Crucial FAQ section. You may find an easy solution for your problem. Adding RAM is often the most cost-effective upgrade you can make to speed up a computer. 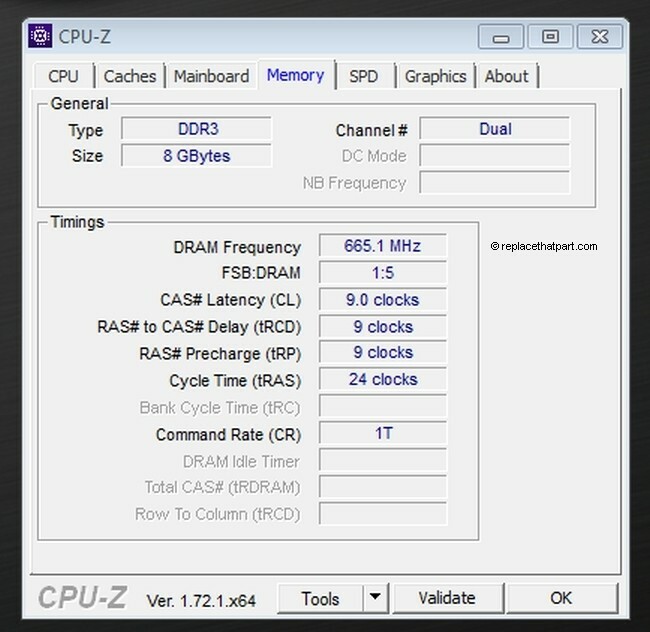 When a computer runs short of RAM, it’s forced to swap the overflow data on and off of the hard drive, which can significantly slow performance. 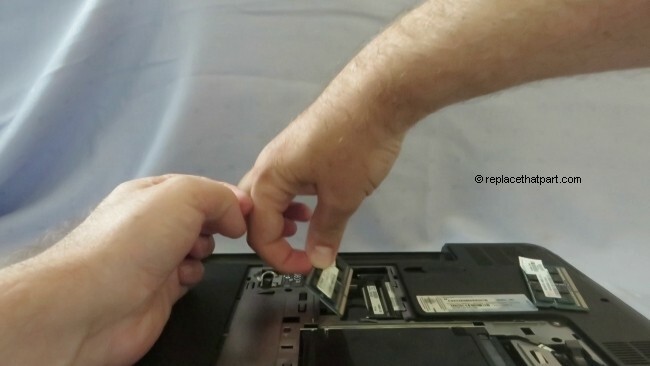 Fortunately, upgrading netbook memory is often one of the easiest computer upgrades. 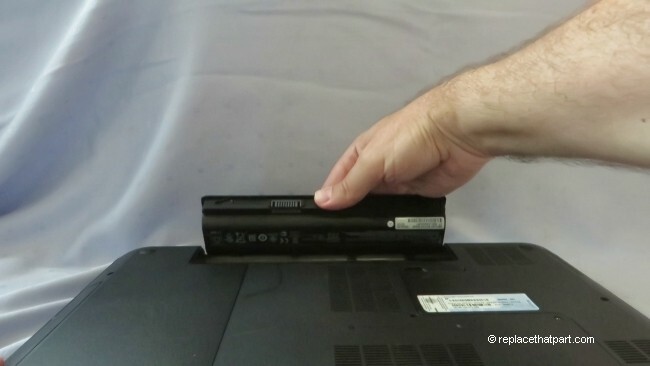 Do you want to get a little more power out of your Samsung NB30 Pine Trail powered Netbook? Upgrade that 1GB memory module with a 2GB SODIMM. It will speed up opening new applications, running multiple applications at once, and switching between software applications (multi-tasking). 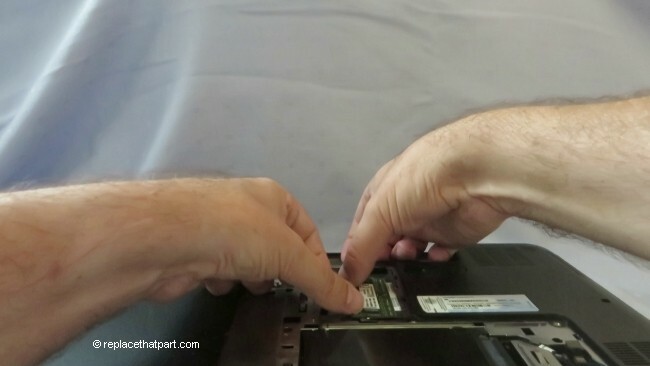 Here’s a complete and easy guide on how to upgrade your Samsung NB30’s memory. Intel Atom N450 (Pineview) based machines can’t access more than 2GB of RAM in total. A 1GB memory module is installed in the memory slot at the bottom of your computer. There is, however, only one memory slot on the motherboard, so this means that you’ll have to remove the current RAM module in order to insert a new one. For your Samsung NB30 you need a standard 200 pin DDR2 SODIMM laptop memory module (not desktop memory). 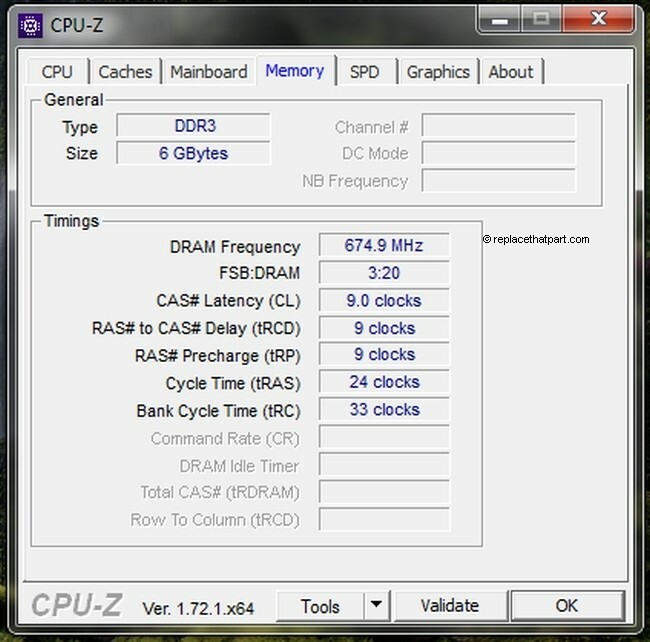 Select a 2GB DDR2 SODIMM memory module of 667MHz or 800MHz. These may be referenced as PC2-5400 or PC2-6400. Recommended brands include, but are not limited to, Crucial, Corsair, Kingston, Patriot, Hynix and Viking. Crucial 2GB Single DDR2 667MHz (PC2-5300) CL5 SODIMM 200-Pin Notebook Memory Module CT25664AC667. This is by far the most popular Netbook memory replacement at the moment. A 1GB memory module is installed in the memory slot at the bottom of your computer. There is, however, only one memory slot on the motherboard so this means that you’ll have to remove the current RAM module in order to insert a new one. The procedure to replace the memory is described below. 1. Shut down the computer completely. 2. 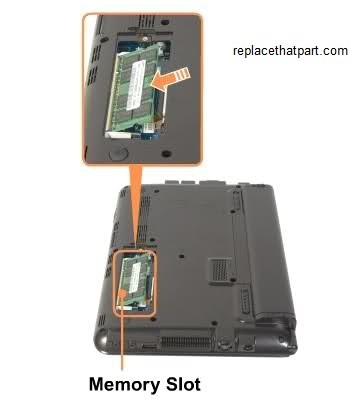 Power off your Samsung NB30 Netbook if it’s on. Also, unplug the AC power adapter. 3. 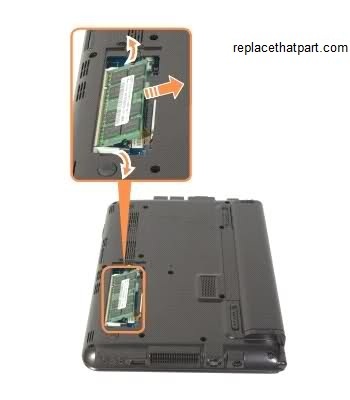 Prepare your netbook by placing it upside-down on a flat surface with some form of soft padding. 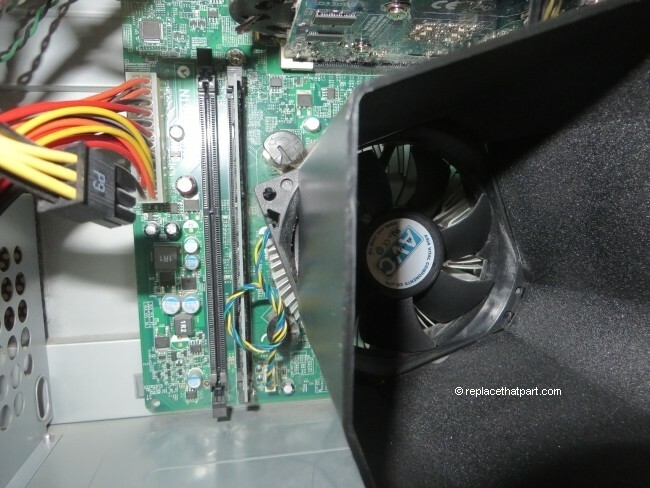 Static electricity can damage your module and other computer parts. Make sure that you are working in a static-safe environment. Remove any plastic bags or papers from your work space. 4. Remove the battery. This will prevent you from accidentally shorting anything on the system board during this process. Pull the two battery latches outwards, then remove the battery. 5. Discharge residual power by pressing the power button. 6. Be sure to ground yourself. Touch something metal, like a tap, for a couple of seconds and you should be fine. 7. 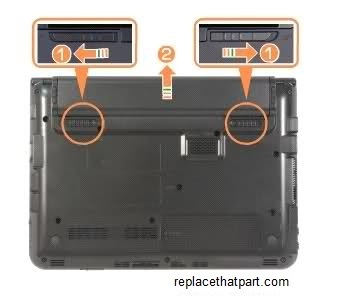 The memory stick is secured in a dedicated compartment at the bottom side of your netbook. a. 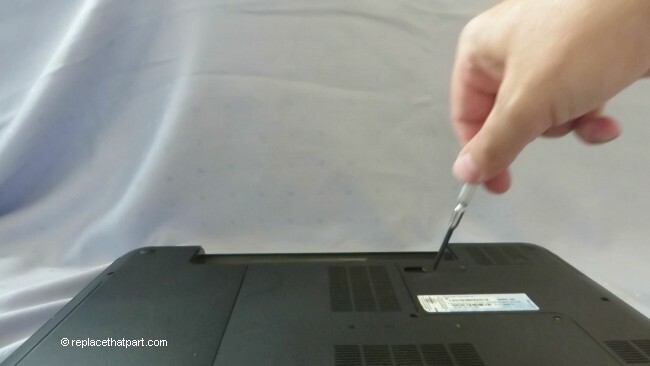 Remove the screw that secures the compartment cover using a Precision Screwdriver Set for Laptops and Electronics . b. Remove the compartment cover. 8. Press outwards on the latches on both edges of the socket at the same time. Remove the SODIMM; it should pop right out. Be sure to save the old SODIMM for future use. 9. Most memory will be sold in a piece of hard, clear plastic. 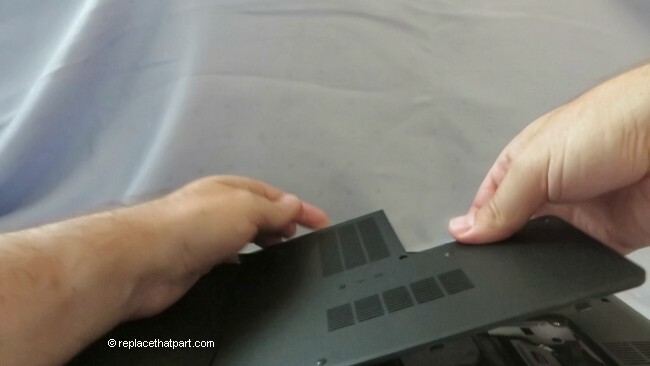 Gently remove the new module from the packaging by pressing on it from the plastic side. 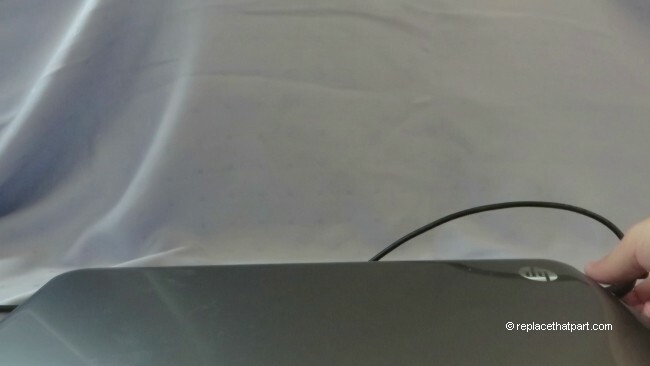 Avoid bending the module or applying too much force to the packaging. When you remove the SODIMM memory module from its packaging hold it by the edges, try not to touch the gold colored contacts as this can damage the memory. 10. Turn the module so the teeth are facing the SODIMM slot. It’s impossible to put the memory module in backwards thanks to the notches which “key” it with the slot. Insert the notched end of the SODIMM into the socket. This is important; you want to stick in the new memory module at a 30 degree angle. 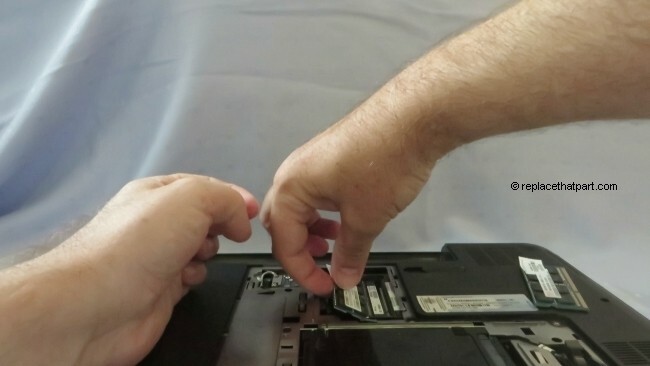 Press the SODIMM firmly, and pivot it until it snaps into place. 11. Push the memory module down so that it’s completely fixed and the metal retaining clips clasp into the grooves on either side of the module. If the memory does not fit easily, take it out and try again. If necessary, push the SODIMM module down, while puling the memory module latches outward. The module should usually be seated so that you don’t see any of the gold contacts. 12. Before you close your case, replace the battery. Just slide the battery into the system. The battery latches move inwards and fix the battery automatically. 13. Turn your computer back on. The BIOS automatically detects the amount of memory in the system and configures CMOS accordingly during the Power-On Self-Test (POST) process. 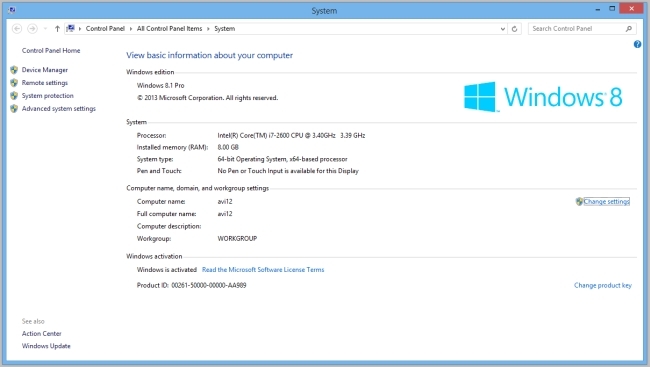 There is no hardware or software (including BIOS) setup required after the memory is installed. You should see the new amount of memory displayed on your start-up screens or in the properties for “My Computer”. 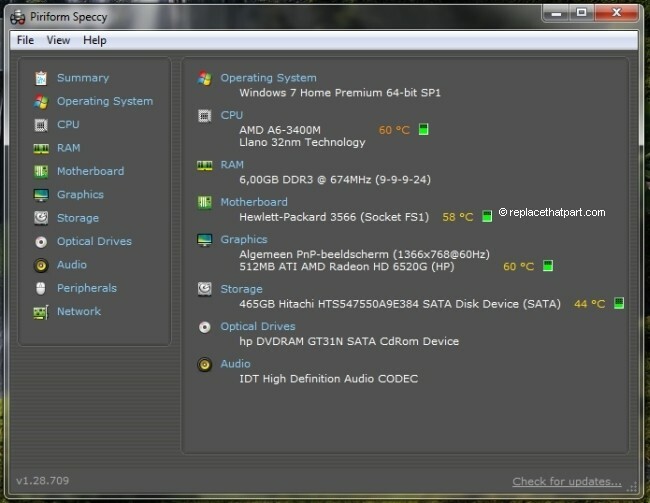 Right click on the “My Computer” icon and select “properties”. The screen which appears should show approximately 2GB of RAM. The memory capacity reported in Windows is less than the actual capacity of memory. 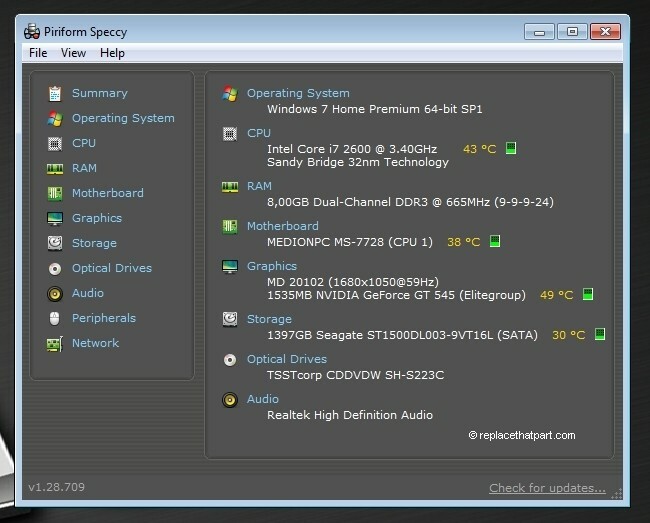 This is because BIOS or the onboard graphics uses a portion of memory or claims it for further use. If you don’t see approximately 2GB in “My Computer”, reboot and press F2 repeatedly until you get to the BIOS screen. It will then see the 2 Gig. 14. If everything works correctly, you are done and you can reinstall the memory compartment cover. If you have any problems, go to step 15 for troubleshooting tips. 15. Troubleshooting. If you have trouble with your new RAM, check these things first. Check the power cords. Is everything plugged in properly? Check the module. Try removing the module and replacing it to make sure it is seated properly in the slot. If you’re still having difficulties with your RAM, check the Crucial FAQ section. You may find an easy solution for your problem. 16. Close the memory compartment cover and fasten te screw.